Happy workers, happy children and why social engagement should start now. – Go India, go future! Happy workers, happy children and why social engagement should start now. A rural village in Kerala, South India. The last preparations are ongoing. The inauguration of the kindergarten will take ok e next week. Today I have met the local architect, artisans and painters. 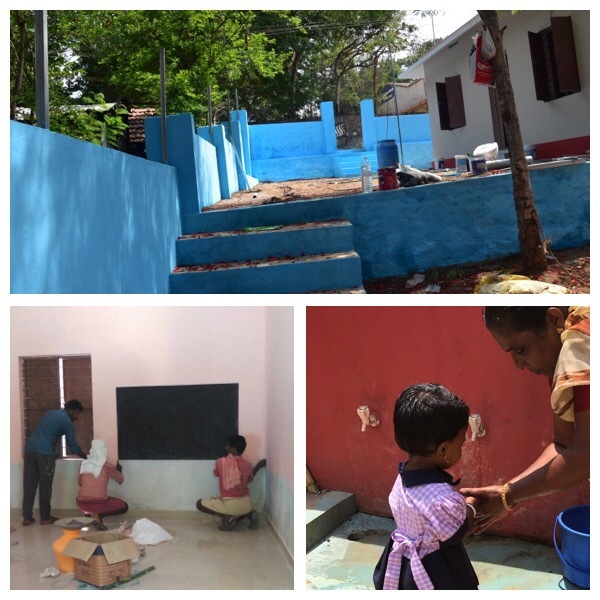 They are all very proud of the work they have done: a new kindergarten building with an innovative rain harvesting system, a clean room for the children, a simple, but healthy kitchen without smoke, some good space to store the food ….and space for a nice kitchen garden. It’s great to see their engagement. I’m proud of them and of my local project team that supports us from NGO site, too. Because caring is what counts at the end: the children can stay in a safe house, teaching lessons about health issues for village people and young pregnant women will take place. Enforcing the local communities is key to the next steps in our Making More Health program. Strategic alignment can happen in parallel. It’s time to act instead of talking. Learning by doing. There are many realities in the world and finding a strategy that fits to all is complicated. However, now is the moment where we can start to engage. We should never postpone in favor of theoretical discussions, should we?